We have covered a variety of stylus pens for the iPad. Most have had the important part of being mobile so we can move freely about with iPad and Stylus. One solution that came up last week is an option that is better suited to staying on your desk. 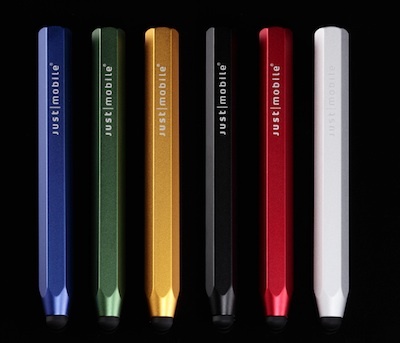 The AluPen is a metal stylus with flat cut sides like a pencil, just much larger around. Sold by Just Mobile, the AluPen comes in six different colors. The tip is on the larger size of the ones we have reviewed before. Generally we are looking smaller to use for handwriting on our iPads, but this tip is better suited for drawing on the iPad with apps like ArtStudio. If the flat sides isn’t enough to keep the Stylus from rolling of your desk, Just Mobile also offers AluCube. A stylus holding block that you can put your AluPen in for that added comfort that you will always know where you Stylus is. 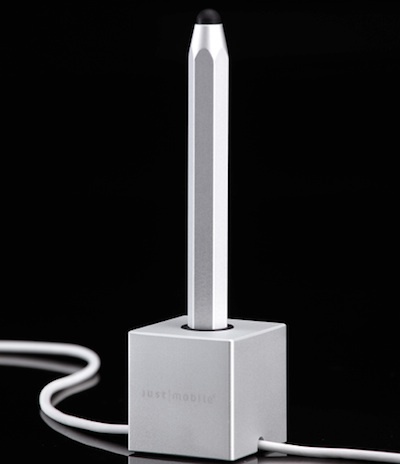 The stylus and cube combination are on the higher side of cost for the iPad pens we have roaming around our offices. The Just Mobile solutions are about both usability and style so look impressive on your desk when folks come in.